Uganda Rugby sevens team lifting the African cup at Legends last year. File photo. RUGBY–Uganda will take on 2014 commonwealth plate winners Wales after they where both drawn in group D at this years’ rugby sevens edition in Australia. 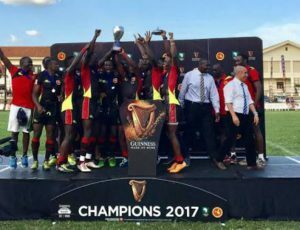 Uganda who qualified for the commonwealth after winning the 2017 Africa Cup Sevens in Kampala when they defeated all four of their opponents including other Africa representatives at the games Namibia, Morocco, Tunisia and Ghana. This will be the four time in a raw that the Rugby Cranes will be featuring in since 2006. The first time Uganda competed at a Sevens tournament in the Commonwealth was back at the 2006 edition in Australia where the the Rugby Cranes finished bottom of group D that featured fellow African nation South Africa, Samoa and Tonga. At the last edition in Scotland, Uganda one and lost two games in a group that featured heavyweights Australia and England. The solitary victory came by virtual of a 17-14 triumph of lowly Sri Lanka. Meanwhile, defending gold medal winners South Africa were drawn in Pool A alongside Scotland, Papua New Guinea and Malaysia. Pool B which has been labelled the ‘group of death’ has England, hosts Australia, Samoa and Jamaica. Kenya were drawn in Pool C alongside New Zealand, Canada and Zambia. The games will be played over 3 days, from April 13-15 at Robina Stadium and the top ranked teams after the group games will advance to the semifinals and play for the medals. Group A. South Africa, Scotland, Papua New Guinea and Malaysia. Group B. England, Australia, Samoa and Jamaica. Group C. Kenya, New Zealand, Canada and Zambia. Group D. Wales, Uganda , Sri Lanka and Fiji.